Next time that sweet tooth craving creeps up on you, satiate it properly at one of the awesome candy stores in Indiana! From classic candy factories to shops with over a century of history, you’ll love all the sweet delights offered at these 10 great candy stores in Indiana! Schimpff’s Confectionery in Jeffersonville, Indiana, is the place to be for good candy and local history. Schimpff’s began their candy making business in 1871, and has seen it all through the years. From floods and depressions, as well as recessions and wars, Schimpff’s is still going strong after 146 years! A family owned and operated business, they’ve become well known for their signature Cinnamon Red Hots. When you walk into Schimpff’s, it’s as if you’ve stepped back in time, complete with a 1950’s original soda fountain (which makes the best chocolate sodas), old school candy jars, and you can even take a tour and watch your favorite candies being made by hand! Head on over to Merrillville, Indiana, and visit Albanese, where everything is made with deliciousness in mind. Serving Indiana for the last 30 years, Albanese prides themselves on using only the best ingredients from America and Europe. Each product has its own unique, memorable taste. Try a milk chocolate double stuffed Oreo cookie. If gummies are more your style, Albanese makes some of the world’s BEST gummies! Try the Sherbet Gummi Bears or the sugar free milk chocolate mint meltaways. Step inside Fuzziwig’s Candy Factory in Noblesville, Indiana, and feel your mouth start to water at all the delicious options to choose from. Open since 1995, Fuzziwig’s is a toy store for candy lovers alike with its carnival like atmosphere. Come one come all! From the traditional candies such as M&Ms and jelly beans, to other old school candies, there is something for everyone here at Fuzziwig’s! Relatively new to the Franklin, Indiana area, Hoosier Cupboard Candy, Snacks, and Ice Cream has been in business since 2015. Located in the Historic Franklin train depot, this location is one of a kind. Family owned and operated, the Smith family has created over 500 tasty assortments. From peanut butter fudge to tart n’ tiny candy and a yummy box of boogers, HCCSIC has some unique and traditional candy for everyone. Not to mention 20 different flavors of hand dipped ice cream! Nate’s Candy Jar has been family owned and operated since 2000, and if you ever find yourself in Gosport, Indiana, be sure to stop by and say hello! While you’re there, try a delicious classic vanilla or sea salt caramel. In the mood for fudge? The chocolate amaretto and dark chocolate caramel sea salt fudge is absolutely delicious! And for your four-legged friend, take home a bag of Fido’s peanut butter, bacon, cheese, and vanilla fudge! Fido will thank you! Periwinkle’s Soda Pop Candy Shop is about bringing families together in downtown Lebanon, having fun, and making lasting memories. Professor Periwinkle (also known as John Krasowski) makes visiting Periwinkle’s a unique and fun filled experience. Be sure to say hello to Caren and Rachel who are absolute dolls! Try some old-school candies such as Jaw Breakers, Abba Zabba, or a delicious bag of assorted grab and go candies. In need of a candy buffet for your next party? Be sure to check out their assorted candy buffet! Head on over to Gas City, Indiana and visit the Nutcracker Sweets, which is a candy store and teddy bear factory all in one. Their customer service is that of the stores of back in the day with that “mom and pop” feel. Nutcracker Sweets provides a unique, family friendly atmosphere. One thing that makes Nutcrackers Sweet different from other candy stores here in Indiana is their selection of international candies! Lowery’s Homemade Candies has been a family owned and operated business since 1941, making the finest and freshest candies that Muncie has to offer. Every chocolate is hand dipped, and each candy is made the old fashion way. Try an assortment of chocolate covered bonbons, or some delicious Dark Secrets. Lowery’s guards their recipes with their lives but rest assure, these Dark Secrets are yummy and sweet! Completely Nuts and Candy Company has been open since 2014 and is a must see for locals and visitors alike. Whether you are craving truffles, turtles, or bear claws, CNCC is the place for all your sweet tooth cravings! 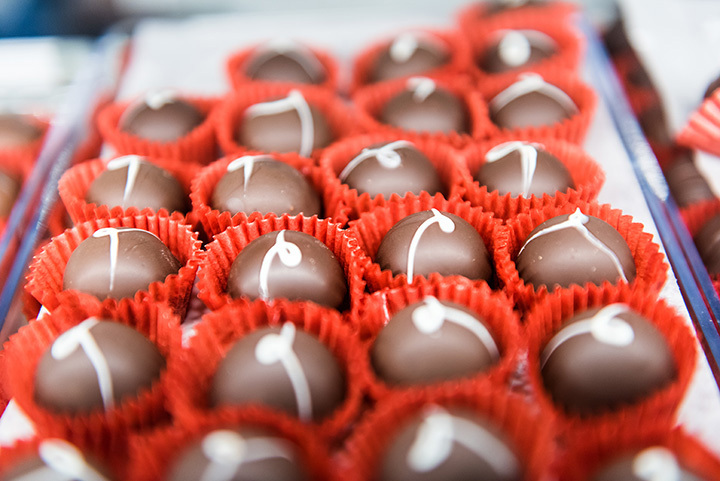 CNCC prides themselves on making quality, homemade chocolate daily. Try a chocolate covered orange peel or chocolate blueberries. If you want a little character with your candy, head on over to Wakaruse Dime Store in Granger, Indiana. The shop itself is a step back in time in this beautiful Victorian era building. From the moment you step inside, you are surrounded by delicious candies. The beautiful staircase invites you to go upstairs and see what other goodies Wakarusa has to offer. Step inside to the hard candy room and let your sugar cravings take control.